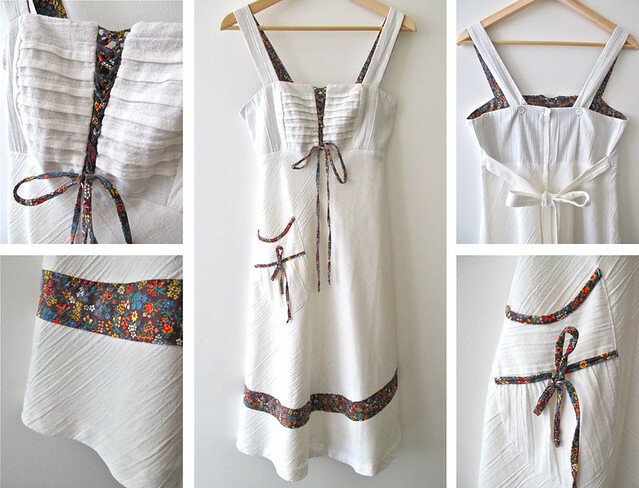 Sweet 1970s white boho dress with so many lovely details! Perfect with your favourite wedges/sandals, and a sun-hat! 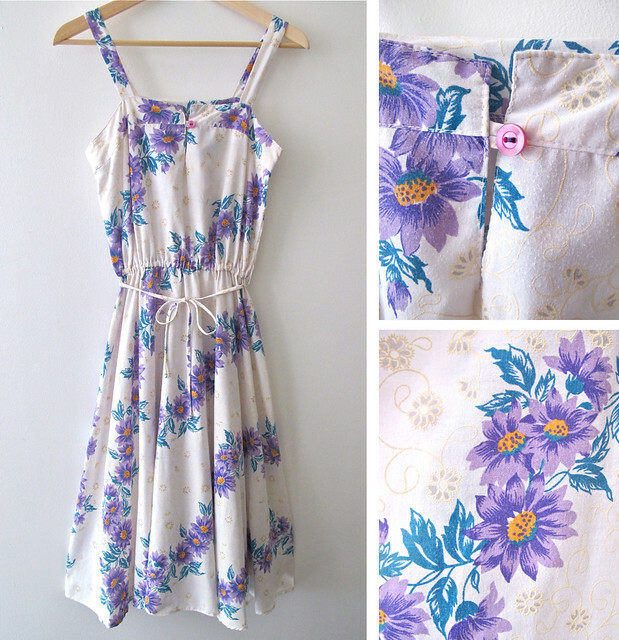 Have fun in the sun with this pretty 1970s sundress with cascading floral prints. 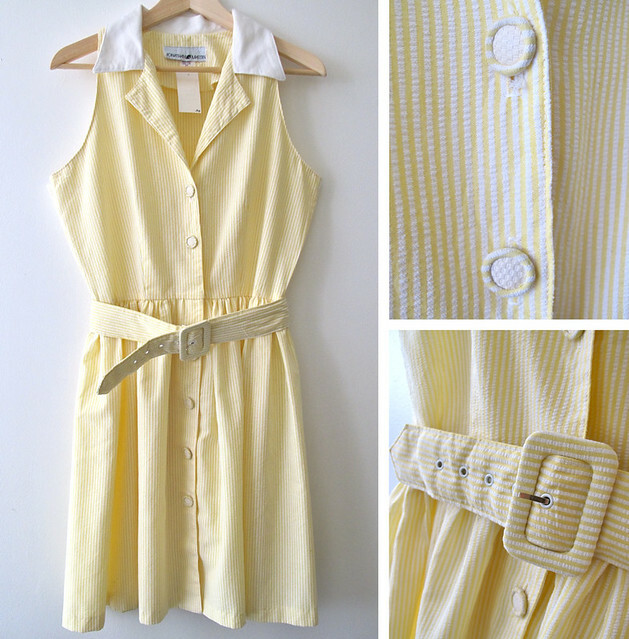 Cute canary yellow striped sundress from the 1980s! If you love floral prints, but scared to be splashed out in too much colour or print, try these subtle, enigmatic, yet feminine floral print dresses in deep blue hues. 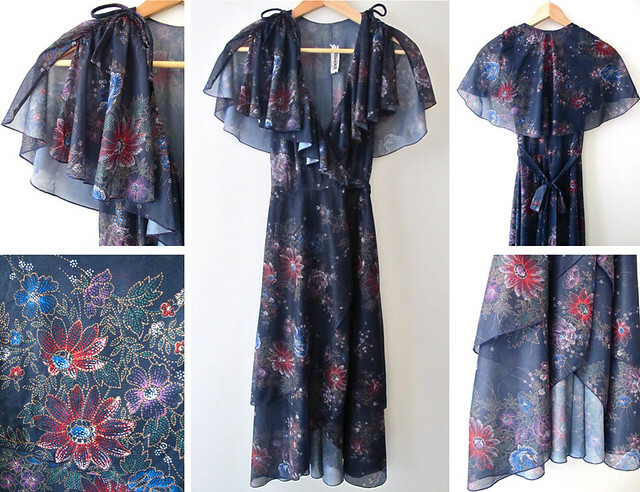 Gorgeous 1970s sheer floral wrap dress with a ruffled v-neckline, flutter-sleeves, and a fish-tail two layer skirt. 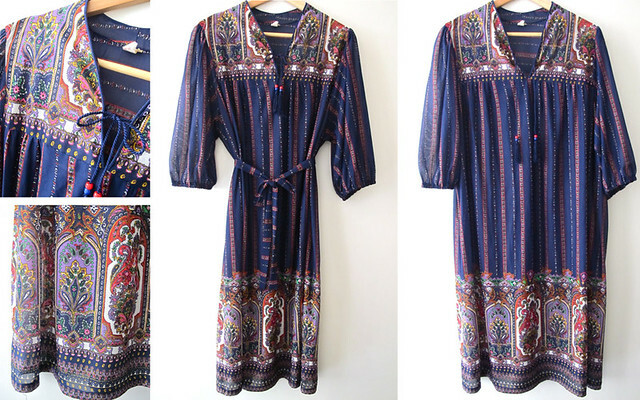 Channel your inner bohemian in this sheer 1970s number! Wear it loose for a carefree vibe, or tie it around the waist with a sash for more definition. 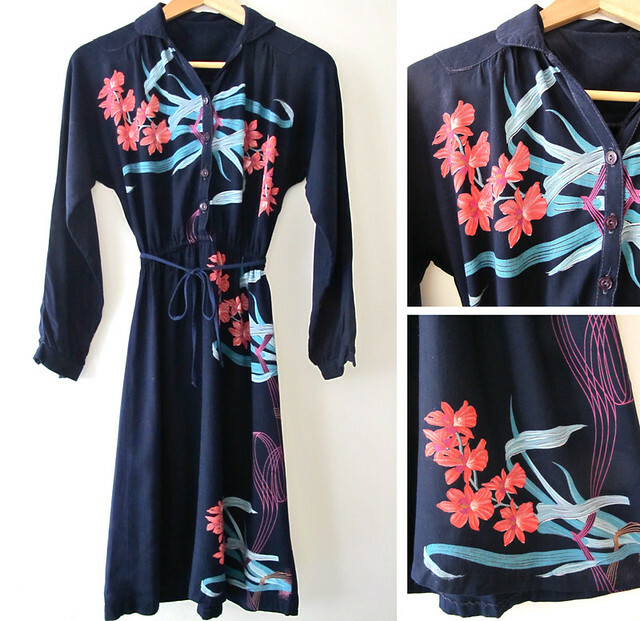 A 1970s arty floral shirt-dress for all occasions! 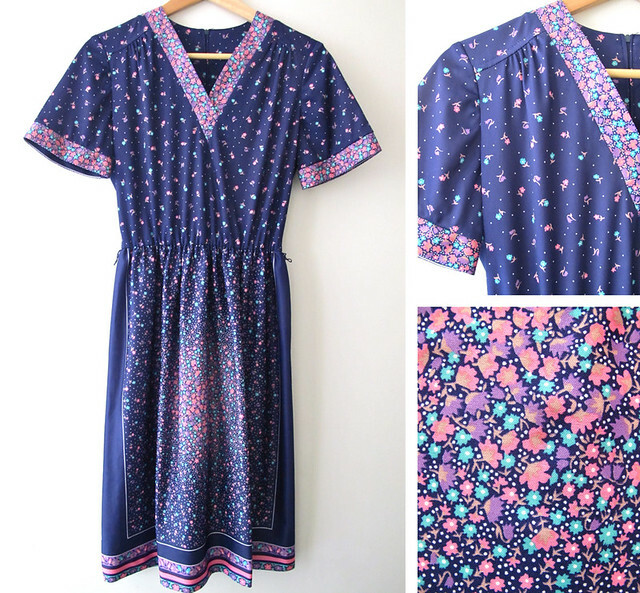 Sweet 1970s dress with tiny floral prints all over, and contrasting floral borders along the neckline, sleeves and the skirt. … the weekend’s here! Pull up one of these fantastic 1980s jumpsuits and get ready for some weekend fun. 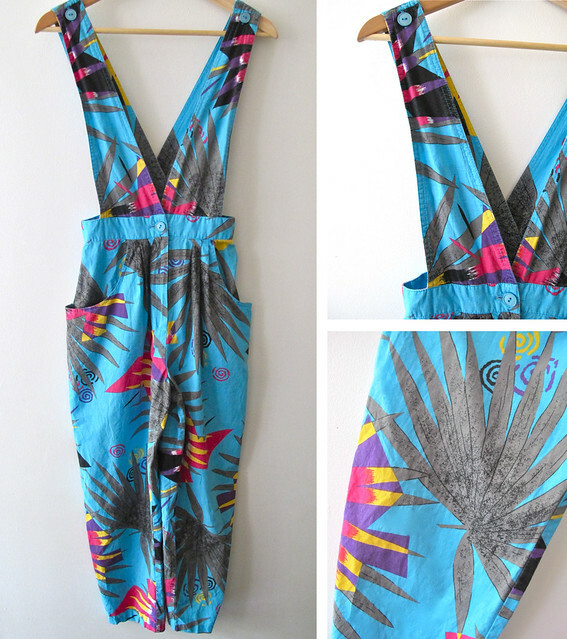 Play it up with this funky 1980s jumpsuit! It’s such a fun number with its bold and bright colours. 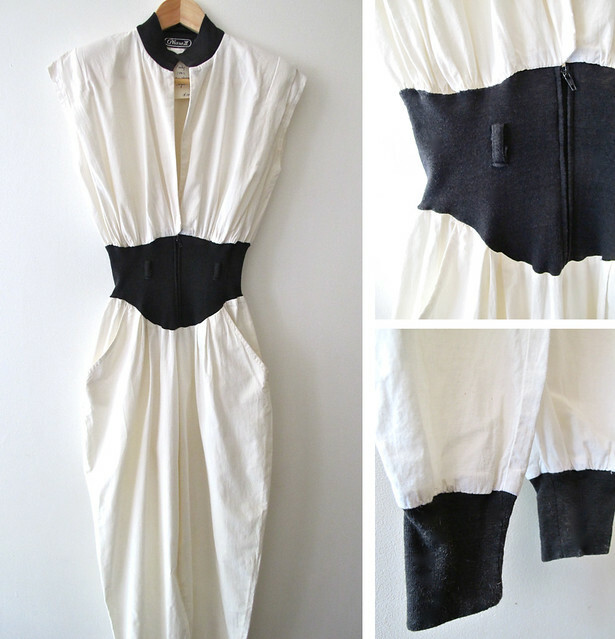 Go monochrome in this snazzy jumpsuit. Such a wearable piece that requires no effort at all to look ready for a day out. 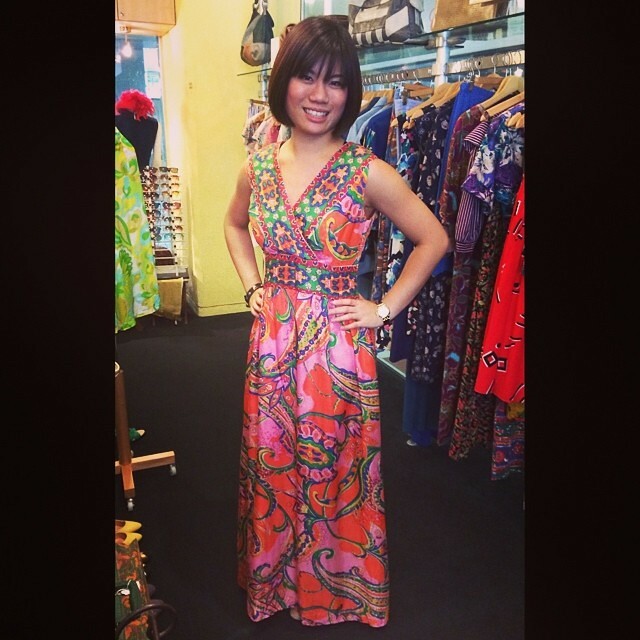 Add a little sizzle to your summer wardrobe with these red-hot vintage dresses! Oh My Gosh! How cute is this?! 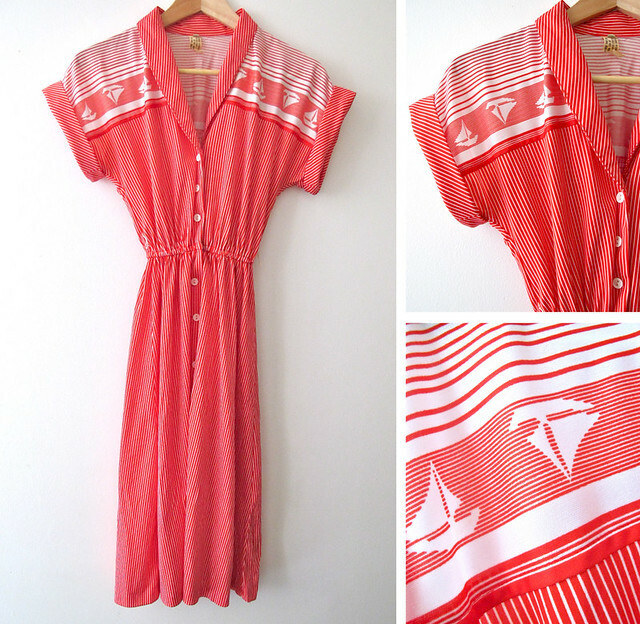 With cute little sailboat prints, up-turned sleeves and stripes of varying widths, this 1980s red and white striped dress screams FUN! 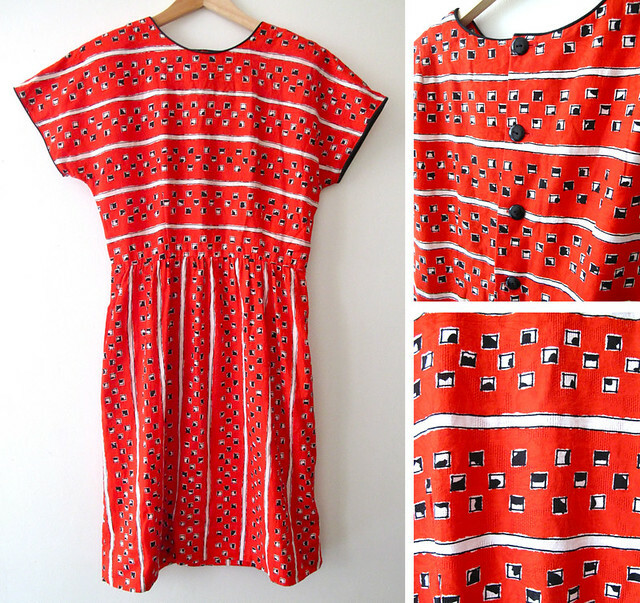 Quirky square prints fill up this easy-to-wear, vibrant, 1980s red, black and white dress! 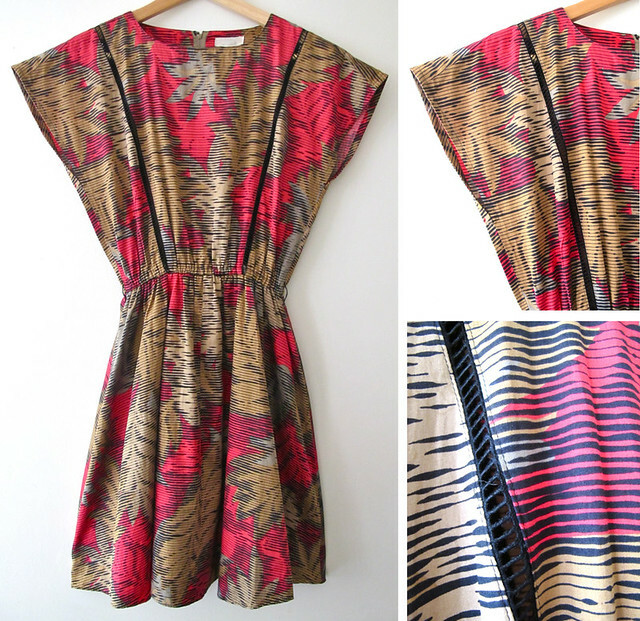 The prints on this 1980s dress kinda look like looking out through window blinds onto falling leaves outside. Another easy-to-wear dress with little pops of red. 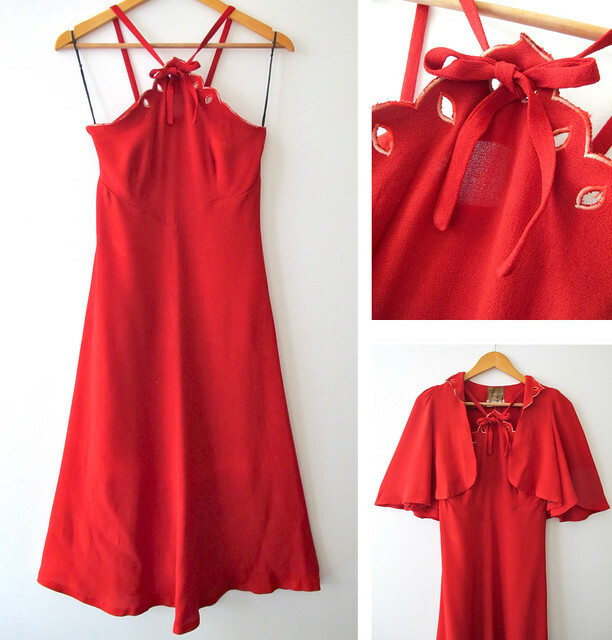 This 1970s red evening dress is a darling! It’s flowy, it’s elegant, and it even comes with the most gorgeous little capelet! 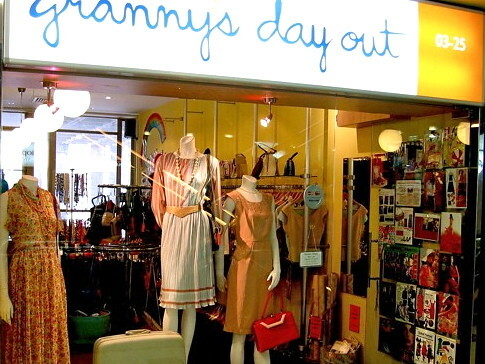 Our vintage boutique in Singapore stocks a wide range of women’s vintage dresses, tops, skirts, bags, shoes and jewellery from the 1920s to the 1980s. These goodies hail from all over the world. Each piece has been handpicked for its age, style, quality, and fabulousness. 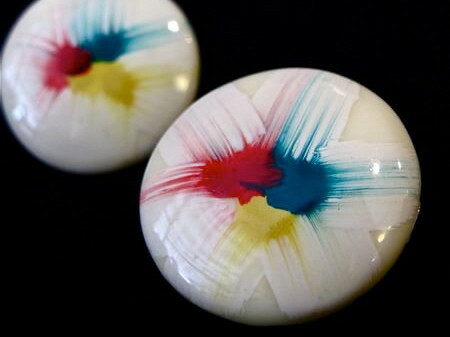 All items have been cleaned and lovingly restored, so you can wear them right away. Love vintage jewels? You've come to the right place! A specially curated range of extra drool-worthy vintage gems is available exclusively online. Each piece is fun, unique and different from what everyone else has. After all, why settle for less?